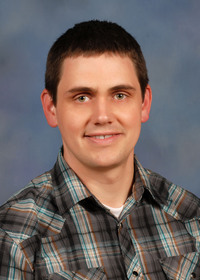 The information presented on this page was originally released on December 29, 2014. It may not be outdated, but please search our site for more current information. If you plan to quote or reference this information in a publication, please check with the Extension specialist or author before proceeding. 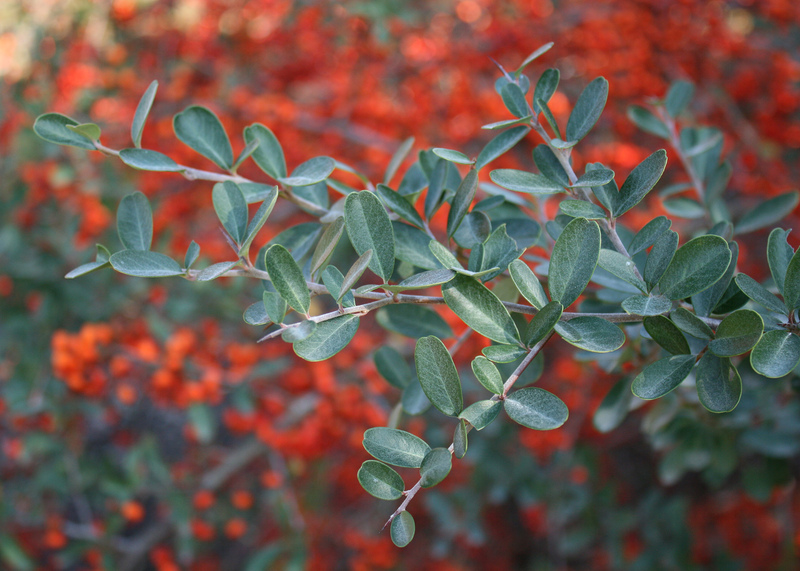 Pyracantha is commonly called firethorn, which is the literal translation of its botanical name. This plant certainly lives up to this name, as it has sharp thorns on almost all of its branches. My fingers and thumbs can attest to the fact that you need to be careful and wear thick gloves when handling pyracantha. One time when I was not paying attention, I grabbed a firethorn branch and my hand felt like it was on fire from the painful punctures. The thorny and painful nature of pyracantha makes this the perfect shrub to plant underneath and around windows. 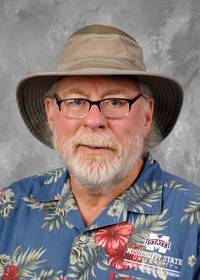 No burglar wants to prune shrubs before breaking and entering. Pyracantha is a great multitasking landscape performer. The foliage is a dark green in the summer, and it is a semi-evergreen in mild winters. Springtime brings out abundant groups of white flowers, and fruit clusters are prominent from the late fall all the way through to the spring. The arching, branching habit of this shrub is accentuated by its production of red-orange fruit toward the ends. The heavy fruit clusters seem to drip off the branches. You can bring in some of the stems with fruit clusters and display them in a vase for a winter decoration. Left unpruned, pyracantha has a casual habit and can grow up to 10 feet by 10 feet, but it is very tolerant of pruning to shape and keep it tidy. In fact, its most popular use in the landscape is as an espalier specimen. This role requires extensive pruning to keep it flat against a wall or trellis. 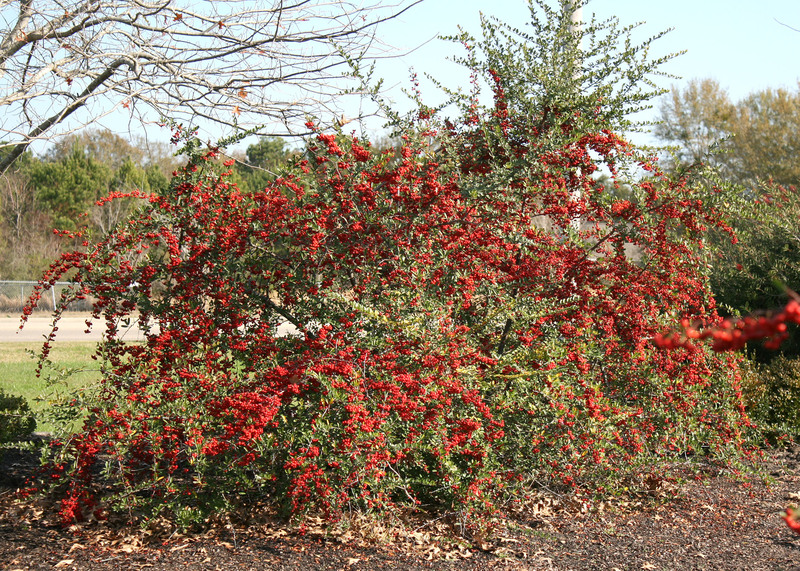 Pyracantha is a fast-growing shrub that is suitable all across Mississippi when planted in the full sun as long as the soil or planting bed is well drained. As with other landscape shrubs, keep the top of the root ball even or slightly above grade. Add a 2- to 3-inch layer of mulch to conserve soil moisture. Pyracantha came from Asia and is not native to North America. You may be surprised to learn that this plant is in the same family as apples, but if you cut a pyracantha fruit in half, you’ll see a family resemblance. The inside of the fruit indeed looks very much like an apple. 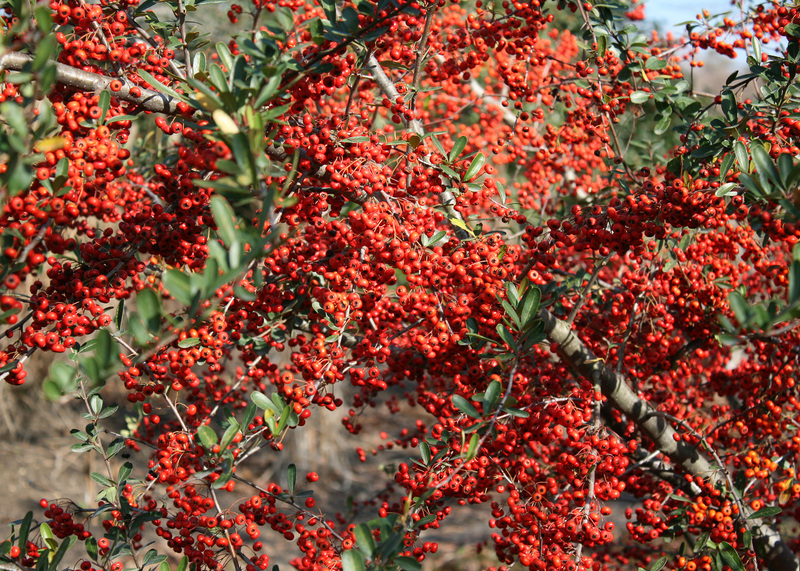 Pyracantha adds beauty to our Mississippi landscapes, and the berries play an important role as a winter food source for birds and other wildlife. If your landscape does not yet have a firethorn, consider adding one for winter beauty.